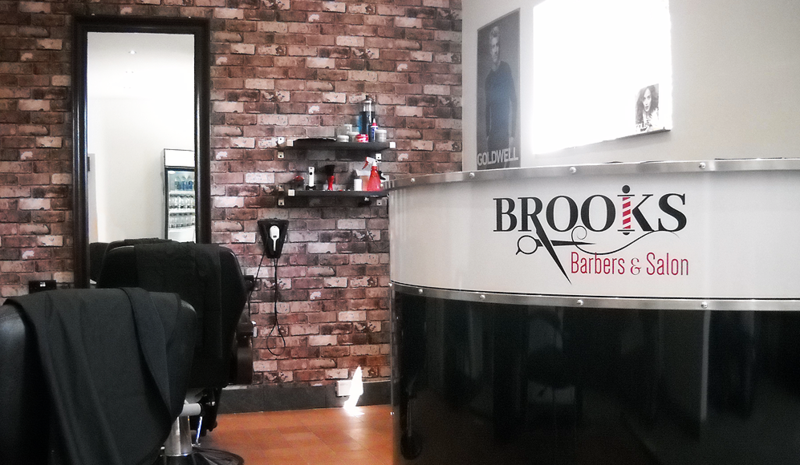 Brooks Barbers & Salon is a brand new business situated in the rural village of Kellington (North Yorkshire). With only the business name confirmed, they contacted Inchpunch Design for creative guidance and marketing support. After establishing the clients desired market positioning we set about creating a logotype that would engage at that level and decided it should visually represent the business for instant recognition. To help achieve this we integrated the scissors and striped barbers pole graphic into the typography. The classic black, white and red colour scheme gave the logo a traditional but contemporary look. Once the logo had been finalised we applied it to a 2m long oval sign fabricated from 3mm thick dibond. As the salon is located next to a busy road (and the only bus route through the village) we made the sign as big as possible within the available space. For additional protection we applied a special anti-graffiti laminate to the front. The sign was mounted to the brickwork via eight attractive stainless steel barrel mount wall fittings. Within the salon, the new logo inspired the decor colour scheme including the branded bespoke reception desk. The initial marketing requirements included a double sided leaflet, business / appointment card (dual purpose) and external swing sign. ​On the leaflet, we wanted to make it very clear that the business catered for both men and women. To further underpin this message we used "realistic" looking models for the main image. The reverse of the leaflet features opening times, price list and a map. The double sided external swing sign simply replicates the leaflet design, creating a consistent brand look. Before contacting Inchpunch Design, I had absolutely no idea what my new logo should look like or what marketing material I needed. Luckily, Craig worked with me and together we came up with a straightforward creative brief and marketing plan. From design to print, Craig took care of everything which allowed me to concentrate on my business. I really love our new branding and thank Inchpunch for all their invaluable support. All content ©Inchpunch Design Limited.